You can always try wiping your iPhone, iPad, or iPod and restore its software, but that’s only possible if you have a second Mac to do the work, since your current Mac won’t talk to your device. Plus, you’ll lose all your data. Of course, if the problem really is the software on your device, that’s what you’ll have to do. Often, though, the problem is with iTunes and its accompanying software. If you want to try to troubleshoot the iTunes application itself so that you can talk to your device, read on. Have you ever wondered how Mac OS X knows to open iTunes whenever you connect an iPod or iPhone? Well, iTunes comes with its own assistant, called iTunesHelper. This is a piece of invisible software that loads every time you log into your account in Mac OS X. In fact, if you open the Users & Groups system preference and click the “Login Items” tab for your account, you should see iTunesHelper listed. While iTunes can run without its helper, it does a much better job communicating with your iPod/iPhone when iTunesHelper is running in the background. Type “iTunes” into the search box. If iTunesHelper is listed, the application is running. Otherwise, it is not. 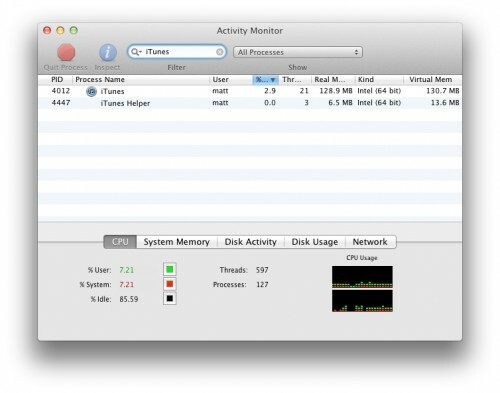 Both iTunes and its helper application are currently running in this view. Note that you can only see the iTunesHelper process if you choose “All Processes” from the pop-up menu to the right of the search bar. If iTunesHelper is not running, check to see that it is in your Login Items in the Users & Groups system preference. If not, you can add it to the list, but the little application is hidden inside the iTunes application. Navigate to your hard drive’s Applications folder, right click on iTunes, and select “Show Package Contents.” A new window with iTunes’ contents appears. Navigate through Contents, then Resources, then iTunesHelper. This is the application, which you can double click to open (invisibly) or drag it to the Login Items view in the Users & Groups system preference (and you’ll need to restart before it automatically opens). While this secret application is helpful, reinstalling iTunes should take care of configuring all of these settings for you. The two lists that follow show the full path name for each file, starting at the top level of your hard drive. You may need to enter your administrator password to delete some of the files. It is perfectly fine if some of the files listed in this section are not on your computer, and you needn’t worry about deleting files that aren’t there! Deleting the above files does not remove any of the music from your iTunes library. It does, however, delete any of your plug-ins (such as visualizers and equalizers). You also lose all of your settings. Make sure you have a backup of anything you are unwilling to lose permanently. Deleting files from your System Library can render your computer unbootable. You should not have to worry if you only delete the files listed in this section, but remember to go slowly, be careful, and do not delete the files if you are unwilling to risk having to reinstall your operating system. Just like with the first list of files, you should restart your computer and then reinstall iTunes. If, after all of this, you still cannot get iTunes to play nicely with your iPod or iPhone, you should probably contact AppleCare or take both your computer and device into an Apple Store. While you can try reinstalling Mac OS X, this rarely solves a communication problem between iTunes and an iPhone/iPod. You are better off talking with Apple about the problem.